PIERROTS PICNIC BY JOE MORLEY. 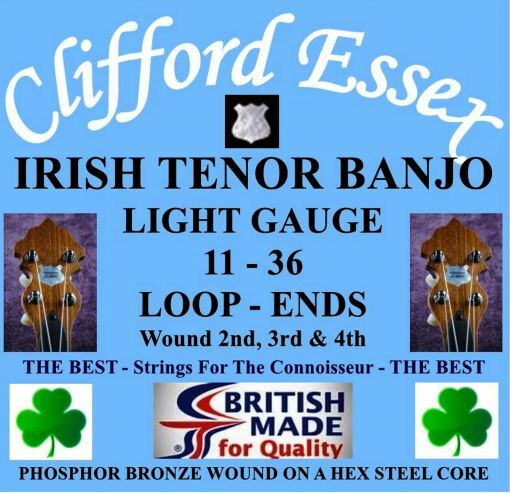 Location: /Strings/Banjo strings/Irish Tenor Banjo/IRISH TENOR BANJO LIGHT GAUGE. NICKEL OR PHOSPHOR ROUND WOUND SET. 11 - 36. WOUND 2ND, 3RD & 4TH. Irish Tenor Banjo Tuning G. D. A. E.
1st .011" Plain Steel Loop or Ball-End. 2nd .016" Nickel or Phosphor Round Wound Loop or Ball-End. 3rd .026" Nickel or Phosphor Round Wound Loop or Ball-End. 4th .036" Nickel or Phosphor Round Wound Loop or Ball-End. Most players choose phosphor bronze wound because of the bright sound they produce, nickel wound strings produce a more mellow tone. Please indicate in the options box below if you would prefer nickel or phosphor wound, loop-ends or ball-ends. TENOR BANJO. CGDA. LIGHT GAUGE. NICKEL OR PHOSPHOR ROUND WOUND SET. 9 - 28.